The HiDow Extra Large Pads are ideal for all purpose massage. Get the most out of your personal therapy session. Two 2″ X 4″ Gel Pads in each set. The large pads are compatible with all HiDow Devices. HiDow electrodes target muscle stimulation on points where pulses are transmitted to motor nerves and muscle fibers. The electrodes simply connect to every HiDow device where it can be placed anywhere on the body. Our replaceable electrodes ranging from sizes Small to Extra-Large to address any parts of the muscle. In addition, we also offer hypoallergenic gel pads for users with sensitive skin. Feel free to mix and match the sizes to best fit your TENS/EMS preference. Because every unit has an A/B ports, you can use a small one for one outlet while a larger one for the next. Extend the life of your pads with the Perfect Conductor Spray to increase its longevity and to enhance the sensation for every use. Our water-based formula means no oils or residue left on top of the skin. To use, lightly spray the Perfect Conductor on any electrode or body wrap and enjoy the solution to pain management. When Should You Replace Your Electrodes? When they can no longer stick to the skin. When intensity settings are faulty and muscle contractions are uncomfortable. When the adhesive is filled with non-removable dust, dirt, or hair. We have replaceable electrodes ranging from sizes Small to Large to address any parts of the muscle. Depending on your needs, you can use a small electrode for your wrist while a bigger one is utilized for the back. You can also mix and match the sizes to best fit your preference. Because every unit has an A/B ports, you can use a small one for one outlet while a larger one for the next. Either way, they serve the same purpose which is to provide you with relaxation along with heightened muscle recovery. Whether you’re buying these electrodes for the first time or you’re looking to replace your old ones, we applaud you! Now, you’re on your way to making a difference in your health as you choose an alternative to medicine. 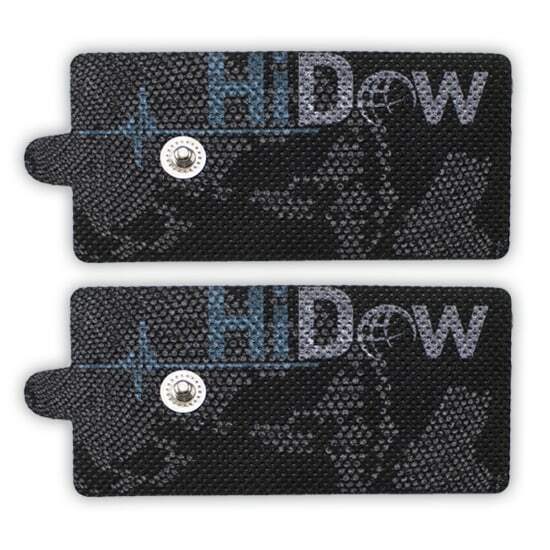 Using HiDow’s TENS/EMS units have no side effects meaning you’ll only reap the benefits. Specially designed for portability and function, every unit serves the same purpose no matter the model. Simply apply your electrodes, adjust the device to your preference, and relax. It’s easy to use even when you’re on-the-go! Mix and match your gel pads today and see which is best for you. I have lower back pain and I have found these pads cover a larger surface area and provide better relief then the smaller sized pads. They work really well for me. My daughter bought this TENS unit for me at a hair show in Las Vegas. It helped tremendously with my shoulder and upper back pain. I love the XL and the large sized pads. I have been using these for several years & love the results.. you can walk, drive, work, exercise while wearing them. I LOVE MY TENS. It helps my back , and my knees. My husband used this for the first time and he loves it .